Amenities: The Harbor club offers 24-hour security, entertainment room, gym, pool, spa, hot tub. Other: The Harbor Club is located as close to the bay as city zoning allows. Adjacent to the Martin Luther King Jr. Promenade (a beautifully landscaped linear park is a favorite for pedestrians, joggers and dog walkers. Its public art enhancements celebrate the dreams of Dr. King). Building was built in the early 1990's, so you will find some individual units that look "dated" while others have been totally remodeled. While the street address is Harbor Drive, thats more for PR, its physical location is on J street between 2nd & 3rd avenues (just in case you are driving there). The Harbor Club condo tower with the 100 in the address is the Western tower and the 200 building is the Eastern tower. West: Units facing west will have great bay views looking out over the Seaport Village area, some obstruction from the four hotel towers (Marriott & Hyatt) a few block over to the West. North: Great unobstructed city views. However, beware of the proposed high rise condo to be built of the huge parking lot across the street. Currently planned to be 38 stories tall. The artist renderings I have seen show a single tower in the NW corner of the parking lot, probably with town homes and a courtyard on the eastern portion of the lot. 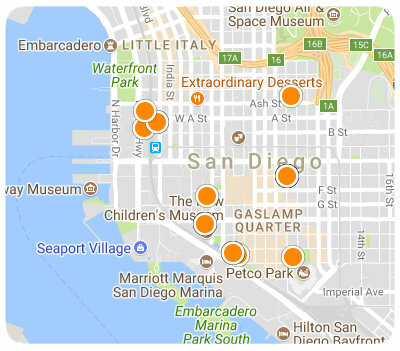 East: Mostly unobstructed views for several blocks as the adjacent building going east of Harbor Club are in the Historic Gaslamp District which is currently height restricted to low to mid rise buildings. About 5 blocks to the East is Petco Park, you can see the stadium and lights but not the playing field because of the orientation of the playing field from South to North. South: I think this is the best view because it has the most water (bay & ocean) view and least amount of obstructions. On a clear day can see all the way down to Mexico. Generally speaking, this is the view the “bubble” units have from the living room. Like the most: Harbor Club residents conveyed to me that they love the never-ending views of the bay, ocean, Coronado and city lights. These units were built to maximize the views. Residents also like the location being so close to the harbor, shopping and restaurants. Like the least: A lot of the residents complained of the lack of storage space and the smallness of the units. This may explain why a large percentage of owners use this as a second home. Single paned windows. A lot of the floor plans look directly into the adjacent (Harbor Club) tower. Other comments: The uniqueness of the Harbor Club twin towers architecture allows this property stand apart from the rest. The windows are only single paned creating large fluctuations in temperatures as the seasons change and depending on the amount of direct sunlight. High HOA fees.